You are at:Home»Lex Pedia»Lex Articles»What is NOTA (None of the Above) ? NOTA stands for ‘None of the above”, also known as “against all” or a “scratch” vote. It is a ballot option in some jurisdictions or organizations to allow a voter to indicate disapproval of all of the candidates in a voting system. It is a right using which a voter can dissent to vote any candidates eligible to be elected in the contest election. In 2009, Election Commission of India asked Supreme Court to offer the voters a “None of the above” option at the Electronic Voting Machines as well as ballot papers. Before this as well, there was a facility of withdrawing from vote, by filling Form 49-O which refers to dissatisfaction of voter with the candidate of that area. This Form filling was also known as Null-Voting. The form 49-O allowed disapproval at the polling booth, which gives a right to the candidate not to vote. This button NOTA provide voters with a right where Nota Votes are COUNTED separately and SECRECY is maintained. In a landmark judgment dated 27th September 2013 in WP (C) No. 161 of 2004, (People’s Union for Civil Liberties and another Vs. the Union of India and another) Supreme Court, directed the Election Commission to introduce a button providing for None of the Above (NOTA) option in electronic voting machines (EVMs) as well as in the ballot papers, in order to exercise a right by the voters to reject undeserving candidates in the election while maintaining their right of secrecy. As it exists today and as per the current laws the candidate who secures the highest number of votes is declared as elected. Since the NOTA cannot be considered as a candidate, the winner would remain unchanged. 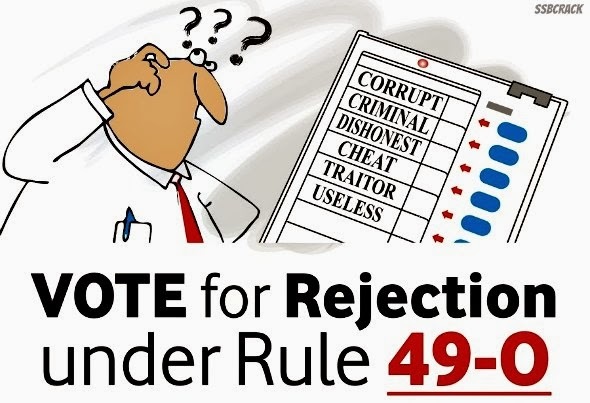 NOTA only gives the voter a right to express disapproval with the kind of candidates that are being put up by the political parties, which will compel political parties to mark themselves with sound candidates better than getting rejected by the voters. It is fundamental to a vibrant democracy and shall foster purity of electoral process and will signal to all political parties and candidates what the voter thinks about them. It will bring out the voters to cast their votes and is a strong step in furtherance of people’s active participation in VOTING. The apex court wants to give people greater choices, but it is unlikely to make much of a difference to the electoral process. In fact, the electoral process would be in a shamble because of this verdict. The result of this option is that the winner remains unchanged. So hardly would anyone make a mark in the queue to press the “none of the above” button, consequent to which the people may refrain to exercise their new right. The only positivity of the option is that it will maintain SECRECY and the vote will be COUNTED. If the rule of probability plays out and no candidate gets an adequate number of votes to win an election, the election commission or the aggrieved party shall move the court and seek necessary permission to conduct a re-election. So, doors of litigation will open again and pendency of cases will increase. A voter may refrain from voting. One of the ways of such expression of abstaining from voting may be by not turning up at all at the elections, which is not an ideal option for a conscientious and responsible citizen. Thus, the only way by which it may be made effectual is by providing a stronger option to the voters to express this right. Hence, the basic requirement to have a lasting value in a healthy democracy is to have a more effective solution. Previous ArticleThe 1st R.N.Sahay National Legal Essay Competition: Submit by August 1, 2014. Prizes Include Cash, Internships, Courses, Publications and Subscriptions.